St Ives Apartments at Gallinas Point - luxury 5 star self catering holiday apartments. Gallinas Point Apartments is perched high above St Ives town with stunning views across Porthminster Beach and to Godrevy Lighthouse. This spectacular south facing development comprises a variety of layouts of luxury apartments and are perhaps the most prestigious self catering apartments in St Ives, The spacious duplex penthouse apartments have awesome views with dual aspects of St Ives, over the harbour and towards Porthminster beach. Five star self catering holidays for the discerning visitor to St Ives without the frustration of parking problems, close to the town and beaches. Leave the car in your secure parking spot at Gallinas Point Apartments and enjoy all that St Ives has to offer, just a short walk away is the hustle and bustle of St Ives town offering visitors the opportunity to enjoy the wide choice of restaurants,the quirky cobbled streets with their interesting shops and art galleries and of course the renowned Blue Flag beaches. 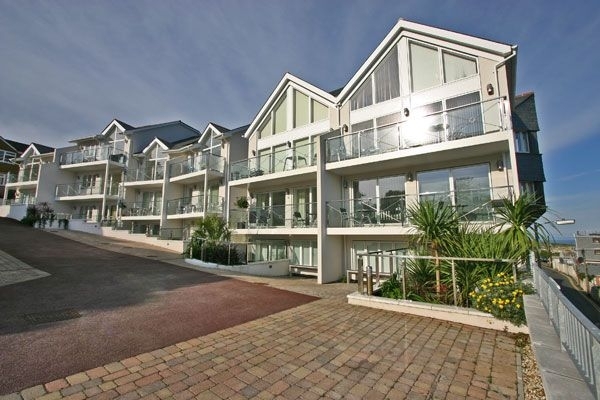 These select luxury St Ives apartments at Gallinas Point are managed and marketed by Carbis Bay Holidays, click Book Now to visit our main website, check availability and make a reservation.